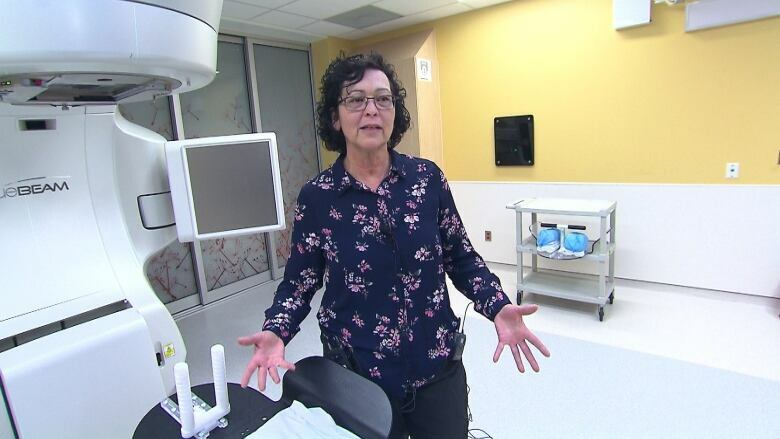 The medical garment developed at the McGill University Health Centre addresses a little-discussed problem that arises when women with larger breasts go in for radiation treatment. This bra isn't designed for style or comfort, but breast cancer patients swear by it. The medical garment developed at the McGill University Health Centre addresses a little-discussed problem that arises when women with large, pendulous breasts go in for radiation treatment. When a patient lies down and part of the breast rests on the ribcage, the radiation can leave a burn on the underside of the breast where the skin of the breast touches the chest wall. 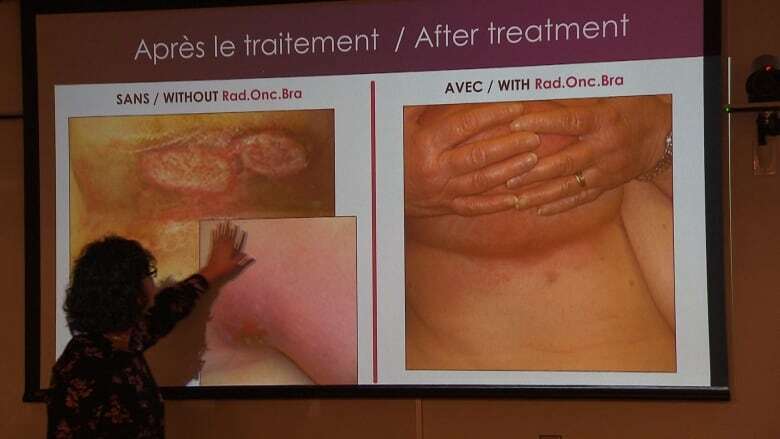 Tarek Hijal, acting director of radiation oncology at the MUHC, said it's "like a sunburn." "Sometimes women have to stop treatment for a few days for their skin to heal, and that is quite difficult for patients," he explained. This is why two radiation oncology technologists — Nancie Raffis and Suzanne Rossel — went to work on a prototype. They perfected the garment, testing it out on patients and tweaking the design for more than five years with funding from the Cedars Cancer Foundation. The newest version, launched officially at the MUHC Tuesday, is a called the Rad.Onc.Bra. "It lifts up the breasts to eliminate all the folds," explained Rossel. The pair partnered with a medical garment designer and invested their own money into the project. 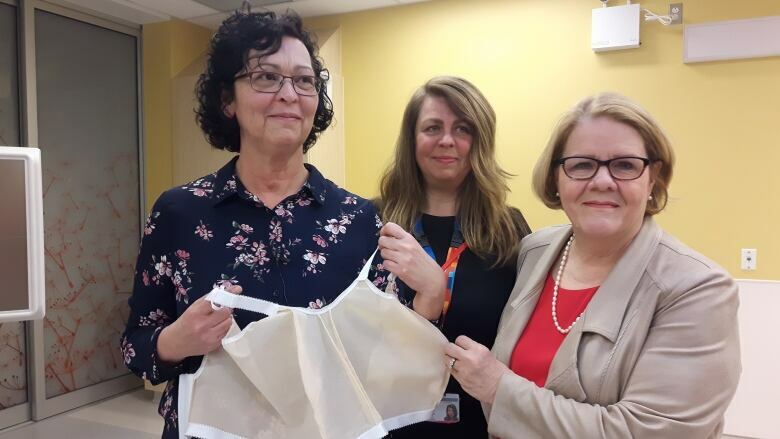 Rossel, who has worked at the MUHC for 33 years, said she's "very happy with the results" — not only does the garment reduce burning, but it also optimizes treatment by keeping the breast in the same exact place every time. Thanks to a $75,000 donation, the MUHC will be able to fund the program and the $70 per patient cost of the bras for the next three years. The creators already have their sights set on expansion so patients elsewhere in Montreal and beyond can benefit from their garment. The hospital has been in touch with the Quebec Health Ministry to try to procure more funding. "I hope that when they see that this works and this helps patients, then they will be interested in helping," said Hijal. The prototype took years to perfect, but the team has still managed to help people along the way. "I thank God that they had this invention," said Ida Mammone. 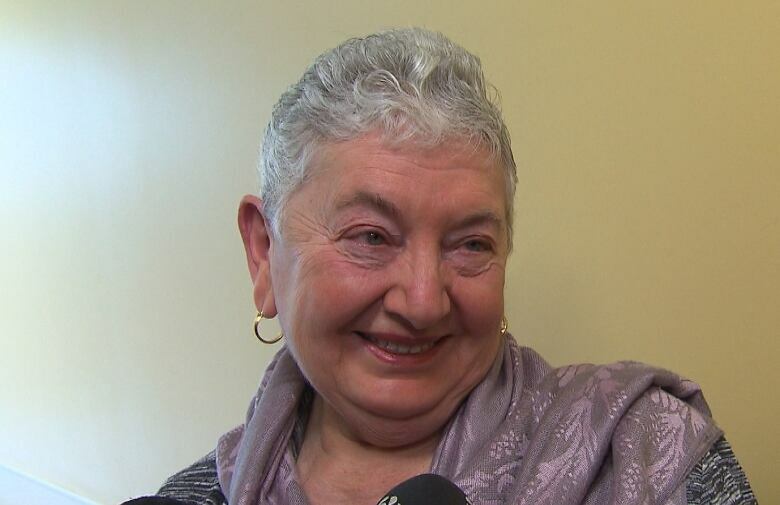 Mammone, 74, was diagnosed with breast cancer five years ago. She went through 20 rounds of radiation, using an earlier incarnation of the Rad.Onc.Bra that looked "more like a corset." She said the technicians were great, putting her into it each time before radiation and taking it off again after the treatment. "I would recommend it to any woman," said Mammone. The MUHC treats more than 700 breast cancer patients annually.